As a result of our friend Allan giving me one of his collection of Roman coins, from the reign of the Emperor Maxentius (above), I have been trying to find out more about this not so well-known Emperor. Factual information is sparse, and although we don’t know the exact date of his birth it was around 278. His father was the Emperor Maximian. To understand where Maxentius fits into the scheme of things it is important to know how the Roman Empire was governed at this point in the third century (and this gets quite complicated….at one time there were 7 people claiming to be Emperor!). Back in the reign of Augustus his successor as Emperor, his stepson Tiberius, was styled “Tiberius Julius Caesar”. This then set a precedent : the Emperor designated his successor by adopting him and giving him the name “Caesar”. After some variation among the earliest Emperors, the style of the Emperor-designate on coins was usually Nobilissimus Caesar or Most Noble Caesar. Then, on the 1st March 293 the Emperor Diocletian established, with Maximian, father of Maxentius, a system of rule by two senior Emperors and two junior sub-Emperors. Here is a coin showing Diocletian and Maximian as joint Emperors….. This system was called the Tetrarchy. The two coequal senior Emperors were styled on coins identically to previous Emperors, as Imperator Caesar NN. Pius Felix Invictus Augustus basically meaning The Pious and Blessed and The Unconquered. They were called the Augusti. The two junior sub-Emperors, the Caesares, were styled identically to previous Emperors-designate, as Nobilissimus Caesar. In 305 the Emperors Diocletian and Maximian abdicated and the former Caesares Constantius and Galerius became Augusti. This was despite the two sons of the Emperors being available – Constantine and our own Maxentius. Severus and Maximinus Daia were the ones appointed Caesars. One of the main sources for the period, Lactantius’ Epitome states that Galerius hated Maxentius and used his influence with Diocletian to see that Maxentius was ignored in the succession; it may also be that Diocletian thought Maxentius was not qualified for the military duties of the imperial office. Indeed we don’t know of any important military or administrative positions that one might expect him to have held during the reign of his father. When Constantius died in 306 in Eboracum (York)………..below the impressive Roman multangular tower still surviving in York….. ……..the armies of Britain and Gaul, without observing the ‘rules’ of the Tetrarchic system, hastened to proclaim Constantine, the young son of Constantius, as Augustus and he was subsequently accepted by Galerius into the Tetrarchy as Caesar. This set somewhat of a precedent for Maxentius. What happened next was that when rumours reached the capital that the Emperors would subject the Roman population to the capitation tax, like every other city of the empire, and also wanted to dissolve the remains of the Praetorian Guard, which were still stationed at Rome, riots broke out. A group of officers of the city’s garrisons turned to Maxentius to accept the imperial purple, probably judging that the official recognition which was granted to Constantine would not be withheld from Maxentius, son of an Emperor as well. Maxentius accepted the honour, promised donations to the city’s troops, and was publicly acclaimed Emperor on October 28, 306. The usurpation obviously went largely without bloodshed (Zosimus names only one victim); the prefect of Rome went over to Maxentius and retained his office. Apparently the conspirators turned to Maxentius’s father Maximian as well, who had retired to a palace in Lucania, but he declined to resume power for the time being. Maxentius refrained from using the titles Augustus or Caesar at first and styled himself princeps invictus (“undefeated prince”), in the hope of obtaining recognition of his reign by the senior emperor Galerius. However, the latter refused to do so. Apart from his alleged antipathy towards Maxentius, Galerius probably wanted to deter others from following the examples of Constantine and Maxentius and declaring themselves Emperors. Constantine firmly controlled his father’s army and territories, and Galerius could pretend that his accession was part of the regular succession in the Tetrarchy, but neither was the case with Maxentius: he would be the fifth emperor, and he had only a few troops at his command. Galerius reckoned that it would be not too difficult to quell his usurpation, and early in 307, the Augustus Severus, doing Galerius’s bidding, marched on Rome with a large army. However, the majority of this army consisted of soldiers who had fought under Maxentius’ father Maximian for years, and as Severus reached Rome, most of his army went defected to Maxentius, whom the soldiers saw as rightful heir of their former commander. No doubt they were also influenced by the fact that Maxentius dealt out large amounts of money. When Maximian himself finally left his retreat and returned to Rome to assume the imperial office once again and support his son, Severus with the rest of his army retreated to Ravenna. Shortly after he surrendered to Maximian, who promised that his life be spared. After the defeat of Severus, Maxentius took possession of northern Italy up to the Alps and the Istrian peninsula to the east, and assumed the title of Augustus, which (in his eyes) had become vacant with the surrender of Severus. Maxentius managed to be recognized as Emperor in central and southern Italy, the islands of Corsica and Sardinia and Sicily, and the African provinces, all of which were due to be hit by the unpopular tax reforms of Diocletian and his father. The joint rule of Maxentius and Maximian in Rome was tested further when Galerius himself marched to Italy in the summer of 307 with an even larger army. While negotiating with the invader, Maxentius repeated what he had done to Severus: by the promise of large sums of money, and the authority of Maximian, many soldiers of Galerius defected to him. Galerius was forced to withdraw, plundering Italy on his way back. Some time during the invasion, Severus was put to death by Maxentius, probably at Tres Tabernae near Rome (the exact circumstances of his death are not certain). After the failed campaign of Galerius, Maxentius’ reign over Italy and Africa was firmly established. Beginning in 307 he tried to arrange friendly contacts with Constantine, and in the summer of that year, the father Maximian traveled to Gaul, where Constantine married his daughter Fausta and was in turn appointed Augustus by the senior Emperor. However, Constantine at the same time was trying to avoid breaking with Galerius, and did not openly support Maxentius during the invasions. In 308, probably around April, Maximian tried to depose his son in an assembly of soldiers in Rome but, surprisingly to him, the present troops remained faithful to his son, and he had to flee to Constantine. In the conference of Carnuntum, in the autumn of that same year, Maxentius was once again denied recognition as legitimate Emperor, and Licinius was appointed Augustus with the task of regaining the usurper’s domain. Late in 308, Domitius Alexander was acclaimed Emperor in Carthage, and the African provinces seceded from Maxentian rule. This produced a dangerous situation for Maxentius, as Africa was critical to Rome’s food supply (which was often the key factor in deciding whether Emperors succeeded or not). Constantine had set aside his wife Minervina in favour of Fausta. As the sister of Emperor Maxentius, Fausta had a part in her own father’s downfall. In 310 Maximian died as a consequence of an assassination plot against Constantine. Maximian had decided to involve his daughter Fausta, but she revealed the plot to her husband, and the assassination was disrupted. Maximian died, by suicide or by assassination, in the July of that same year. Empress Fausta was held in high esteem by Constantine, and proof of his favour was that in 324 she was proclaimed Augusta…….. …….previously she held the title of Nobilissima Femina. However three years later Fausta herself was put to death by Constantine, following the execution of Crispus, his eldest son by Minervina, in 326. The two deaths have been inter-related in various ways; in one, Fausta is set jealously against Crispus, as in the anonymous Epitome de Caesaribus, but conversely her adultery, perhaps with the stepson who was close to her in age, is also suggested. Fausta was executed by suffocation in an over-heated bath, a mode of assassination not otherwise attested in the Roman world. David Woods offers the connection of overheated bathing with contemporaneous techniques of abortion, a suggestion that implies an unwanted, adulterous pregnancy according to Constantine’s biographer Paul Stephenson. Constantine then ordered the ‘damnatio memoriae’ of his wife with the result that no contemporary source records details of her fate. Literally meaning ‘damnation of memory’ in theory, this punishment was meant to be inflicted upon traitors or those who brought discredit to the Rome. In practice, however, it could be imposed on anyone that was not in the Senate’s or the Roman Emperor’s good books. The name of a person was scratched away from public inscriptions. In addition, statues of a condemned individual could be reworked, or the faces of their images mutilated, and more rarely coins would be defaced. Eusebius, ever the sycophant, mentions neither Crispus nor Fausta in his Life of Constantine, and even wrote Crispus out of the final version of his Ecclesiastical History. Maxentius’ eldest son Valerius Romulus died in 309, at the age of about fourteen, was deified and buried in a mausoleum in the Villa of Maxentius at the Via Appia. Nearby, Maxentius also constructed the Circus of Maxentius. After the death of Maximian in 309 or 310, relations with Constantine rapidly deteriorated, and Maxentius allied with Maximinus to counter the alliance between Constantine and Licinius. He allegedly tried to secure the province of Raetia north of the Alps, thereby dividing the realms of Constantine and Licinius (reported by Zosimus); the plan was not carried out, as Constantine acted first. In 310, Maxentius lost Istria to Licinius, who could not then continue the campaign. However, by the middle of 310 Galerius himself had become too ill to involve himself in imperial politics and he died soon after on April 30th 311. Galerius’s death destabilised what remained of the Tetrarchic system……. Tetrarchy was quickly abandoned as a system (though the four quarters of the empire survived as praetorian prefectures) in favour of two equal, territorial Emperors, and the previous system of Emperors and Emperors-designate was restored, both in the Latin-speaking West and the Greek-speaking East. On hearing the news of the death of Galerius and the failure of Licinius against Maxentius, Maximinus mobilized against Licinius, and seized Asia Minor before meeting Licinius on the Bosphorus to arrange terms for peace. In the meantime, Maxentius fortified northern Italy against potential invasions and sent a small army to Africa under the command of his praetorian prefect Rufius Volusianus which defeated and executed the usurper Domitius Alexander in 310 or 311. Maxentius used the opportunity to seize the wealth of his supporters, and to bring large amounts of grain to Rome. He also strengthened his support among the Christians of Italy by allowing them to elect a new Bishop of Rome, Eusebius. Maxentius was far from secure, however. His early support was dissolving into open protest. By 312, he was a man barely tolerated, not one actively supported. Without the revenues of the empire, Maxentius was forced to resume taxation in Italy to support his army and his ambitious building projects in Rome. The election of a bishop did not aid much, either, as Diocletian’s persecution had split the Italian church into competing factions over the issue of apostasy. The Christians of Italy could easily see that Constantine was more sympathetic to their plight than Maxentius. In the summer of 311, Maxentius mobilized against Constantine while Licinius was occupied with affairs in the East. He declared war on Constantine, vowing to avenge his father’s “murder”. Constantine, in an attempt to prevent Maxentius from forming a hostile alliance with Licinius, forged his own alliance with Licinius over the winter of 311–12 by offering to him his sister Constantia in marriage. Maximin considered Constantine’s arrangement with Licinius an affront to his authority. In response, he sent ambassadors to Rome, offering political recognition to Maxentius in exchange for military support. Two alliances, Maximin and Maxentius, Constantine and Licinius, therefore lined up against one another. The Emperors prepared for war. Maxentius expected an attack along his eastern flank from Licinius, and stationed an army in Verona. Constantine had smaller forces than his opponent: with the forces withdrawn from Africa, with the praetorian and Imperial Horse Guard, and with the troops he had taken from Severus, Maxentius had an army equal to approximately 100,000 soldiers to use against his opponents in the north. Many of these he used however to garrison fortified towns across the region, but keeping most stationed with himself in Verona. Against this, Constantine could only bring a force of between twenty-five and forty thousand men. The bulk of his troops simply could not be withdrawn from the Rhine frontiers without negative consequences. It was against the recommendations of his advisers and generals therefore, and against popular expectation, that Constantine anticipated Maxentius, and struck first. As early as weather permitted, late in the spring of 312, Constantine crossed the Alps with a quarter of his total army, a force equivalent to something less than forty thousand men. Having crossed the Cottian Alps at the Mont Cenis pass, he first came to Segusium (Susa, Italy), a heavily fortified town containing a military garrison, which shut its gates to him. Constantine ordered his forces to set its gates on fire and scale its walls, and took the town quickly. Constantine forbade the plunder of the town, and advanced into northern Italy. At the approach to the west of the important city of Augusta Taurinorum (Turin, Italy), Constantine encountered a large force of heavily armed Maxentian cavalry, labeled clibanarii or cataphracti in the ancient sources. In the ensuing battle Constantine spread his forces into a line, allowing Maxentius’ cavalry to ride into the middle of his forces. As his forces broadly encircled the enemy cavalry, Constantine’s own cavalry charged at the sides of the Maxentian cataphracts, beating them with iron-tipped clubs. Many Maxentian cavalrymen were dismounted, while most others were variously incapacitated by the blows. Constantine then commanded his foot soldiers to advance against the surviving Maxentian infantry, cutting them down as they fled. Victory, the panegyrist who speaks of the events declares, came easily. Turin then refused to give refuge to the retreating forces of Maxentius. It opened its gates to Constantine instead. Other cities of the north Italian plain, recognizing Constantine’s quick and clement victories, sent him embassies of congratulation for his victory. He moved on to Milan, where he was met with open gates and jubilant rejoicing. He resided there until the middle of the summer of 312 before moving on. It was now expected that Maxentius would try the same strategy as against Severus and Galerius earlier; that is, remaining in the well-defended city of Rome, and sitting out a siege which would cost his enemy much more. For somewhat uncertain reasons, he abandoned this plan, however, and offered battle to Constantine near the Milvian Bridge on October 28, 312. Ancient sources usually attribute this action to superstition or (if pro-Constantinian) divine providence. Maxentius of course had consulted soothsayers before battle, as was customary practice, and it can be assumed that they reported favourable omens, especially as the day of battle would be his dies imperii, the day of his accession to the throne (which was October 28, 306). What else may have motivated him, is open to speculation. The armies of Maxentius and Constantine met north of the city, some distance outside the walls, beyond the Tiber river on the Via Flaminia. Christian sources, claim that Constantine fought under the labarum (a military standard that displayed the Christian Chi-Rho symbol) in that battle, revealed to him in a dream. Of the battle itself, not much is known – Constantine’s forces defeated Maxentius’s troops, who retreated to the Tiber, and in the chaos of the fleeing army, trying to cross the river, Maxentius fell into the water and drowned. His body was found the next day and his head paraded through the city, and later sent to Africa, as a sign that he had surely perished. The battle was one of a succession of victories that by AD 324 made Constantine master of the entire Roman Empire, but it is most famous for its link with his conversion to Christianity. The story, or a story, of what happened at the battle was told by Eusebius of Caesarea, the Christian biblical scholar and historian who wrote the first biography of Constantine soon after the Emperor’s death. He knew Constantine well and said he had the story from the Emperor himself. Constantine was a pagan monotheist, a devotee of the sun god Sol Invictus, the unconquered sun. However before the Milvian Bridge battle he and his army saw a cross of light in the sky above the sun with words in Greek that are generally translated into Latin as In hoc signo vinces (‘In this sign conquer’). That night Constantine had a dream in which Christ told him he should use the sign of the cross against his enemies. He was so impressed that he had the Christian symbol marked on his soldiers’ shields and when the Milvian Bridge battle gave him an overwhelming victory he attributed it to the god of the Christians. In AD 315 the Senate dedicated a triumphal arch in Rome to Constantine (it was probably built originally for Maxentius), with an inscription praising him because ‘with divine instigation’ he and his army had won the victory. It tactfully refrained from saying which god had provided the ‘instigation’ and citizens could credit it to Sol Invictus or the Christian deity or whichever god they chose. What is not in doubt is that Constantine became a believing Christian who vigorously promoted Christianity from that point onwards without trying to force it down pagan throats. The Cross of Light – A Meteor Impact? What was the celestial event that converted Constantine and altered the course of history? Incredibly it might have been a meteor impact. Jens Ormo, a Swedish geologist, and colleagues working in Italy believe Constantine witnessed a meteoroid impact. The research team believes it has identified what remains of the impactor’s crater. It is the small, circular Cratere del Sirente in central Italy. It is clearly an impact crater, Ormo says, because its shape fits and it is also surrounded by numerous smaller, secondary craters, gouged out by ejected debris, as expected from impact models. Radiocarbon dating puts the crater’s formation at about the right time to have been witnessed by Constantine and there are magnetic anomalies detected around the secondary craters – possibly due to magnetic fragments from the meteorite. According to Ormo, it would have struck the Earth with the force of a small nuclear bomb, perhaps a kiloton in yield. It would have looked like a nuclear blast, with a mushroom cloud and shockwaves. After Constantine’s victory, he issued a ‘damnatio memoriae’ against Maxentius, ………..and following the usual epithet that it is the victors that write History, Maxentius was systematically vilified and presented as a cruel, bloodthirsty and incompetent tyrant. While he was not counted under the persecutors of the Christians by early sources like Lactantius, under the influence of official propaganda, later Christian tradition framed Maxentius as hostile to Christianity as well. This image has left its traces in all of our sources and has dominated the view of Maxentius well into the 20th century, when a more extensive use and analysis of non-literary sources like coins and inscriptions and buildings has led to a more balanced image. In fact, Maxentius was a prolific builder whose achievements were overshadowed by Constantine’s issue of the damnatio memoriae against him. He seemed to be fond of them! Many buildings in Rome that are commonly associated with Constantine, such as the great Basilica in the Forum Romanum (below), were in fact built by Maxentius. Work on what we might call the Basilica of Maxentius and Constantine was begun by Emperor Maxentius in 306 but finished six years later under Constantine; it was marked by eight colossal pillars alongside columns that no longer stand today. Of the 66-foot-high columns, only 1 of the 8 survived the 1349 earthquake. That one was brought by Pope Paul V to Piazza Santa Maria Maggiore in AD 1614. Five meters up a large part of the square-paneled vault remains, called “cassettoni” in Italian; you can also see similar work in the dome of the Pantheon. The building rose close to the Templum Pacis and the Templum Veneris et Romae, whose reconstruction was also part of Maxentius’ interventions. The central nave was covered by 3 groin vaults suspended 128 ft above the floor on 4 large piers, ending in an apse at the western end containing the Colossus of Constantine (remnants of which we have seen in a courtyard of the Palazzo dei Conservatori of the Musei Capitolini….truly colossal!). The lateral forces of the groin vaults were held by flanking aisles measuring 75 x 56 ft. The aisles were spanned by 3 semi-circular barrel vaults perpendicular to the nave, and narrow arcades ran parallel to the nave beneath the barrel vaults. Similar to many basilicas at the time such as the Basilica Ulpia, the Basilica Nova featured an absolutely huge open space in the central nave. the nave itself measuring 83 x 265 feet creating a floor of roughly 21,528 square ft. Running the length of the eastern face of the building was a projecting arcade. On the south face was a projecting (prostyle) porch with 4 columns (tetrastyle). Instead of having columns support the ceiling, the entire building was built using arches. This was a much more common appearance in therma than in basilicas. The Basilica is reckoned to be a marvel of Roman engineering work and used the most advanced engineering techniques known including innovations taken from the Mercatus Traiani and the Thermae Diocletiani. At the time of construction, it was the largest structure to be built. That in itself makes the Basilica Nova a unique building. It is one of the largest concrete structures built in ancient Rome, with remains that still stand today as the tallest structure in the ancient Roman Forum. One of the reasons the building is considered to be such a triumph of Roman engineering is due to its use of both cross and barrel concrete vaults. These vaults were not only notable for their size, but the vaults also stood unsupported and unreinforced which still causes many engineers to question how they were structurally able to stand. Another difference from traditional basilicas is the roof of the structure. While traditional basilicas were built with a flat roof, the Basilica Maxentius was built with a folded roof, decreasing the overall weight of the structure and decreasing the horizontal forces exerted on the outer arches. No wonder the Basilica of Maxentius and Constantine was one of the preferred models for Renaissance architecture, especially for Bramante. Another of Maxentius’s impressive buildings is The Mausoleum of Valerius Romulus, his son, which reopened to the public in 2014 after 20 years of restoration. The large circular structure was built by Maxentius in the early 4th century, probably as a family tomb, on the Appian Way. When his young son died around 309 A.D. — he is said to have drowned in the Tiber — he was buried in the mausoleum. But the tomb itself was part of a larger imperial complex that included Maxentius’ palace and a circus for chariot racing. Little of the palace is still standing, while the mausoleum has lost its second level but is still an impressive structure, inside and out. It is surrounded by a quadroporticus on the outside with its main entrance on the Via Appia and two smaller entrances facing the palace and the circus. On the mausoleum itself, the main entrance facing the Appia was walled up centuries ago. It has now been reopened in the recent restoration. Inside, the crypt has a large central pillar with a circular corridor onto which open niches where the sarcophagi of the royal family would have been deposited. A spacious vestibule connected to the corridor probably once led to the second floor. In December 2006, Italian archaeologists announced that an excavation under a shrine near the Palatine Hill had unearthed several items in wooden boxes, which they identified as the imperial regalia, possibly belonging to Maxentius. The items in these boxes, which were wrapped in linen and what appears to be silk, include 3 complete lances, 4 javelins, what appears to be a base for standards, and three glass and chalcedony spheres. The most important find was a scepter of a flower holding a blue-green globe, which is believed to have belonged to the Emperor himself because of its intricate workmanship, and has been dated to his rule. These are the only known imperial insignia ever recovered, which hitherto had only been known from representations on coins and in relief sculptures. Clementina Panella, the archaeologist who made the discovery states that “These artifacts clearly belonged to the Emperor, especially the scepter, which is very elaborate. It’s not an item you would let someone else have.” Panella notes that the insignia were likely hidden by Maxentius’ supporters in an attempt to preserve the emperor’s memory after he was defeated at the Battle of Milvian Bridge by Constantine. Here is the legend of Catherine……”Catherine was the daughter of Constus, the governor of Egyptian Alexandria during the reign of the emperor Maximian (286–305). From a young age she devoted herself to study. A vision of the Madonna and Child persuaded her to become a Christian. When persecutions of Christians began under Maxentius, she went to the emperor and rebuked him for his cruelty. The emperor summoned 50 of the best pagan philosophers and orators to dispute with her, hoping that they would refute her pro-Christian arguments, but Catherine won the debate. Several of her adversaries, conquered by her eloquence, declared themselves Christians and were at once put to death. Catherine was then scourged and imprisoned. She was scourged so cruelly and for so long, that her whole body was covered with wounds, from which the blood flowed in streams. The spectators wept with pity; but Catherine, strengthened by God, stood with her eyes raised to heaven, without giving a sign of suffering or fear. He ordered her to be imprisoned without food, so she would starve to death. During the confinement, angels tended her wounds with salve. Catherine was fed daily by a dove from Heaven and Christ also visited her, encouraging her to fight bravely, and promised her the crown of everlasting glory. During her imprisonment, over 200 people came to see her, including Maxentius’ wife, Valeria Maximilla; all converted to Christianity and were subsequently martyred. Twelve days later, when the dungeon was opened, a bright light and fragrant perfume filled it, and Catherine came forth even more radiant and beautiful. Obviously modern scholars have tried to find some substantive evidence for the background to this story and indeed whether Catherine actually existed, but there is no evidence that she was a historical figure. However she certainly inspired a huge amount of devoted worship in the Medieval period and since…..indeed her feast day is still celebrated in the Eastern Catholic Church. Joan of Arc claimed that Catherine’s was among the heavenly voices that spoke to her. And of course, she gave us the popular firework the Catherine wheel….She is the patron of philosophers and scholars and is believed to help protect against sudden death. I even found an Italian Pizza establishment that put together a special pizza on her Saints Day! The front of our coin reads…. ‘Imperator Caesar Maxentius Pius Felix Augustus’. I am unable to read the inscription on the reverse, but during AD 308 Maxentius gained control of the mint at Ticinum and issued folles bearing the reverse type legend CONSERVATORES VRB SVAE, stressing his role as protector of Rome. Maxentius added and restored many buildings in the city including the temple of Roma – and our coin appears to show a celebration of the the rebuilding of this temple, with Roma inside her temple holding an orb and sceptre. Could be the sceptre just found…. 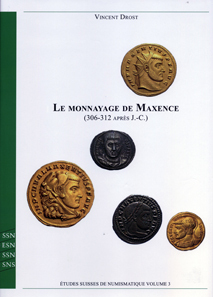 Here is a review of a Swiss study of the coins of Maxentius, which shows that we can find out rather a lot from these sources..
18th July 2013 – In the series “Etudes Suisses de Numismatiques”, issued by the Swiss Numismatic Society, a new, important work on Roman coins has recently been published. It is a corpus of the coinage of Maxentius with a detailed commentary that exceeds by far that what the RIC can provide. Let’s start with the catalog that certainly will attract most interest. This is no die corpus – no one would be able to prepare such a thing given the wealth of material from the 3rd century, but a listing of all types and subtypes, i.e. literally everything Maxentius has to offer. Arranged according to mints, dates, metals, Vincent Drost presents the basis of his work, in which he is much more meticulous than the RIC. All collectors who enjoy the different variants of late Roman coinage will find a marvelous overwiew here. As already said, this is the basis, and the catalog being written in French is no obstacle to its comprehensibility for every single type and subtype is illustrated in the plates. Strictly speaking, it is here where the author’s work truly starts, with the material he makes talk at great length. Don’t worry if your schoolroom French is a bit rusty. As I said before, the Swiss Numismatic Society has published this book, meaning that the author provides a detailed 17-page summary of his results that was being translated into Italian, English and German. Quite a luxury one would wish for, for the sake of spreading knowledge in other countries as well. Additionally, the 17-page summary most likely gets more readers than the actual text that covers 200 pages. By reading it you’ll learn that Maxentius possessed five mints that didn’t produce simultaneously, though; Rome was the only mint Maxentius had at his disposal during his entire reign. Drost describes in detail how coinage and minting were organized – and, of course, looking into the French text always pays off when you want to go into details. The author likewise clarifies the metrological basis and hypothesizes about the scale of the production. The chapter on circulation goes beyond a mere listing of known treasure finds. On the basis of the content of treasure finds, Drost proves the emperor to be isolated both economically and politically. FYI, after Maxentius was being defeated at the Milvian Bridge, a large portion of his coins were collected and brought to the Constantinian mints to be melted down, evidenced by the Treasure of Gruissan that was lost in 313 near the Gallic coast. Naturally, the author interprets the messages of the coins as well, and, by comparing it with coins of other emperors, proves that Maxentius actively sought alliances. His religious policy, which was overshadowed by Constantine, and his relationship with the city of Rome are magnificently mirrored in the depictions. The biggest part, in terms of quantity, is taken up by dealing with individual mints and their products. The author patiently deals with series after series, before he gets to Maxentius in imperial coinage. Unfortunately, the subject of modern counterfeits has received little attention. An overview of all the coins the author, him being the greatest expert on the coins of Maxentius, has excluded from his work would have been appreciated here. Writing this as the reviewer, one is inclined to be happy about that since, otherwise, how else would it be possible to pick holes in such a thorough, masterful and important study? In popular culture Maxentius is the main antagonist of the 1961 film ‘Constantine and the Cross’. The character is played by Massimo Serato. Other films have also portrayed Maxentius as a ‘baddy’. In the 2014 film Katherine of Alexandria, Maxentius was portrayed by Julien Vialon.